Imagine a world in which engineers can interact with 3D models in an immersive environment, where machines and products communicate with each other, and where products wend their way independently through the production process. This is Industry 4.0, the Fourth Industrial Revolution, deﬁned as the convergence of digital and physical technologies, and being realized today in smart factories across the globe. Industry 4.0 has created a great need for knowledge transfer, as manufacturers attempt to keep pace with new technological advancements in a constantly evolving industry. In 2018, Automation Alley, Michigan, USA Industry 4.0 knowledge center, a nonproﬁt association, serving technology and manufacturing companies across the state, took an unprecedented approach into the creation of its ‘Technology in Industry Report., bringing together industry and academia to create a data-rich guide to Industry 4.0 adoption to accelerate innovation. This report features research from seven leading Michigan universities and colleges and corporate insight from a number of industry stakeholders, providing a comprehensive look into the eight technology sectors of Industry 4.0. The report includes a look at emerging trends, implications for industry and culminates with an action plan to help manufacturers increase revenue, reduce costs and think strategically. What is clear from the collective work of the research partnership is the need for new ways of thinking to address the disruptive dynamics associated with Industry 4.0 and the emerging marketplace. 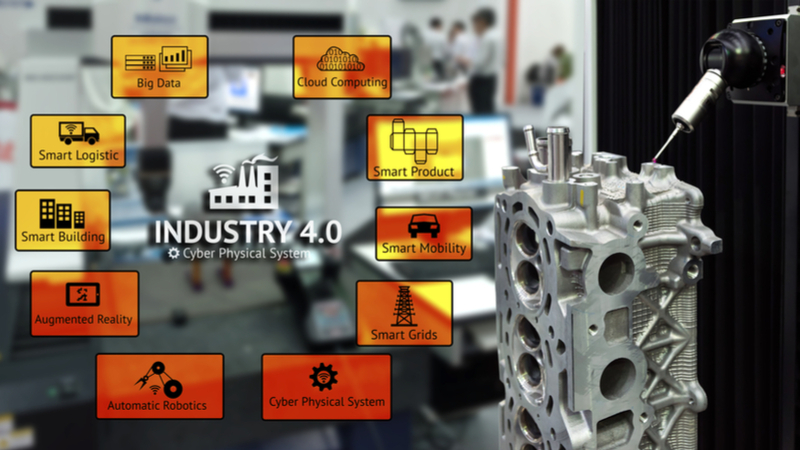 Industry 4.0 is primarily recognized as the digitization of the process ﬂows of businesses, where Big Data and the Internet of Things (IoT) are two of its most important technology components. The impact of IoT on business is transformative. Its applications are widespread and will impact decision making across our lives. In today’s competitive environment, companies are in relentless pursuit for lowering cost and increasing revenue streams. Businesses realize that lowering costs and discovering new revenue streams requires them to unlock the power of these digital technologies. Productivity increase, in turn, is supported by the collection, circulation and analysis of large volumes of data in real time. However, the volume of data is so large, that it is humanly impossible to collect and analyze. Thus, the concept of IoT was born, where all machines and systems connected to production and/or transactions are able to collect and save massive volumes of information, in a completely automated way, totally devoid of any human involvement. Machines and devices—such as cars, refrigerators, TVs, ovens and even factory ﬂoors—are connected to the internet, sending constant information, generating large volumes of data, which, when interpreted well, can yield serious information. Data and information are valuable (and we have more than ever before), but companies will be able to diﬀerentiate themselves by the people, tools and execution utilizing that data. Industry 4.0 is bringing tremendous change in ways we have yet to fully comprehend. The companies who can grow a new mindset and new skill-sets within their organizations are likely to ﬁnd greater success. Domestic vs. foreign adoption of Industry 4.0 will not be identical or on the same timeline. If you have multinational operations, do not try a one-size-ﬁtsall approach. Academic institutions must address the urgent need to collaborate with industry, each other and policy makers to realign and reform education around the needs of the marketplace. Don’t underestimate the “people factor.” This will be your greatest asset as well as your greatest hindrance to success.